Are you happy with your current supplier of vaping coils? If you’re like most vape shop owners, we’re willing to bet that working with your current wholesale distributor is one of your least favorite things to do. Is it time for you to fire your current wholesaler? These are some of the most common challenges that vape shop owners in face. Do any of these situations sound familiar to you? Here at Vapors Planet, we’ve witnessed the problems in the wholesale vaping industry firsthand, and we think it’s time to do something about those problems. We’re about to transform the way that you buy vaping coils. You find it hard to tell whether you’re getting the best possible price because it’s difficult to know whether you’re working with a true wholesaler or just another middleman offering a quantity discount. You rarely feel like you’re getting a true business-to-business experience. You constantly receive email advertisements from companies in China offering bulk vaping coils at unbelievably low prices. You’re hesitant to act on those offers, though, because you’re nervous about the possibility of receiving counterfeit goods. You also can’t afford to wait several weeks to receive the goods – your customers want them now. You find it difficult to get any support from your current supplier after you’ve made a purchase. It’s always easy to reach a salesperson when you need to make an order, but no one seems to be available if you have a question or problem after the sale. You struggle to find a balance between ordering in high enough quantities to get the best prices and avoiding dead inventory. You worry about ordering bulk coils for a tank that might end up being unsuccessful. For every vaping tank that becomes a hit, dozens of others never find a customer base. Why Is Vapors Planet different? We are a local Cincinnati business. Since we’re in close proximity to you, we can deliver vaping coils at a speed that no other wholesaler can match. When you order from us, you can generally expect to receive your coils in two business days or less. Since we’re local, we can’t hide behind an anonymous website with a nondescript contact form. We think of each customer as a valued long-term partner, and we’re always available if you have a question or problem. Unlike most online sellers that simply add “wholesale” to their names in an attempt to attract business from local vape shops, we are true wholesalers who understand the complexities of B2B commerce. We aren’t just another middleman. We bear the risk of having products shipped from China, and negotiating directly with the factories helps us secure the best possible prices for vaping coils. You’ll enjoy incredible savings when you make us your new supplier of wholesale coils. Since we buy directly from the factories, we can guarantee that our coils are authentic. Every box of coils has a guaranteed valid authenticity code. Our minimum order quantities are reasonable, and we ship orders over $500 for free. Buy only what you need, and stop worrying about unsold coils gathering dust on your shelves! Learn more about shipping here. Vapors Planet Wholesale Reward Program. At Vapors Planet, we appreciate and reward loyalty. The Vapors Planet wholesale rewards program achieves that. Wholesale customers will receive a credit to their account every month once they meet certain monthly spending thresholds. We have rewards for every level! These rewards are based on monthly spend and are calculated at the end of each month. Spend $0 – $999 : Get 0.5% Statement credit added to account. Spend $1,000 – $2,999 : Get 1% Statement credit added to account. Spend $3,000 + : Get 1.5% Statement credit added to account. Your credits will not expire, and you can always check your credit balance in your account section. Buying wholesale vaping coils from Vapors Planet will make your vape shop more efficient, more agile and more profitable. 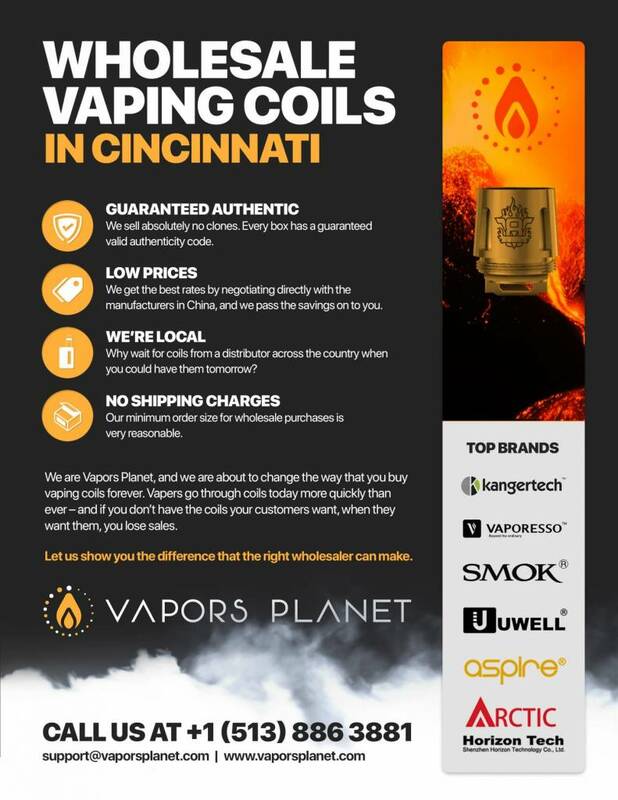 Why buy coils from a supplier halfway across the country when you can work with a wholesaler right here in Cincinnati? Call Vapors Planet today or use the contact form to discuss your needs. We can’t wait to hear from you.